Dual LED illuminations with individual adjustable intensity. 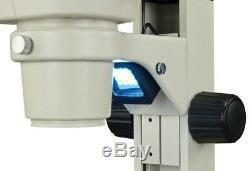 45° inclined binocular viewing head with 1X, 3X objectives. 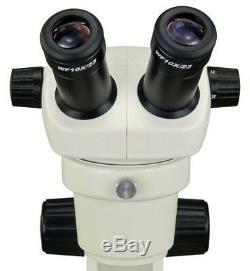 Super widefield 30mm eyepieces WF10X/23 with diopter regulator. 4 (100mm) long working distance and i nterpupillary distance adjustment. Sharp stereo erect images over a wide field view. 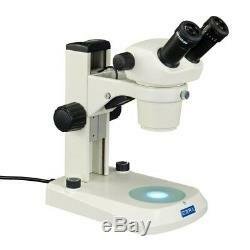 This is a brand new stereo binocular microscope with two magnification power: 10X, 30X. It comes with 45 degree inclined binocular head, a pair of super widefield eyepieces WF10X/23 (30.0mm) with adjustable diopter & built-in rubber ring, and a versatile illumination system that provides both transmitted and reflected LED lights. 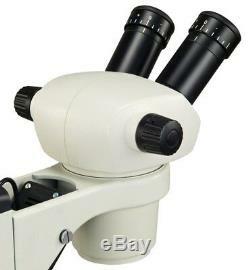 The stereo microscope is useful for many applications: biological research laboratories, engravers, watchmakers, geologists, collectors, jewelers and anyone in electronic industry. 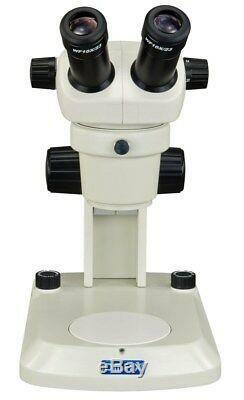 Eyepieces: super widefield WF10X/23 with diopter regulator ±5dp and built-in rubber ring. Viewing head: 45 ° inclined ; binocular. Interpupillary range: 2" 2-3/4" (50mm 70mm). 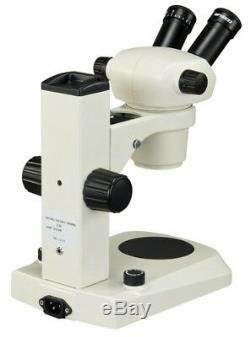 Field of view: 23mm with 10X magnification, 7.7mm with 30X magnification. Focusing adjustment range: 4 (100mm). Incident (upper) illuminator: 2W LED lamp, 90°adjustable inclined angle range. Transmitted (lower) illuminator: 2W LED lamp. Each light has its own intensity control. Frosted glass stage plate: 3-3/4 (95mm) in diameter. White/black plastic stage plate: 3-3/4 (95mm) in diameter. 54mm female thread for barlow lens. Power supply: 100-240V 50/60Hz (USA and Canada plug). Dimension: 11-1/2 " x 7-1/4" x 15 (29cm x 18.5cm x 38cm). Net weight: 9 lb 12 oz (4.5 kg). 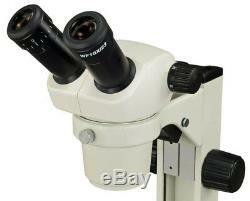 A pair of eyepieces WF10X/23. Frosted glass stage plate (95mm). Black/white plastic stage plate (95mm). Fiber cold lights (ring type and Y type). 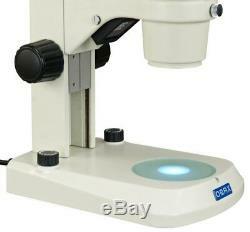 The item "10X-30X Binocular Stereo Microscope with Dual LED Lights Diopter Adjustment" is in sale since Friday, January 23, 2015.